You know how bathroom mirrors tend to get all spotty and covered in view-obscuring droplets that dry on? Well, it's rather gross and unsightly, and you can bet this problem is only worse in communal bathrooms. 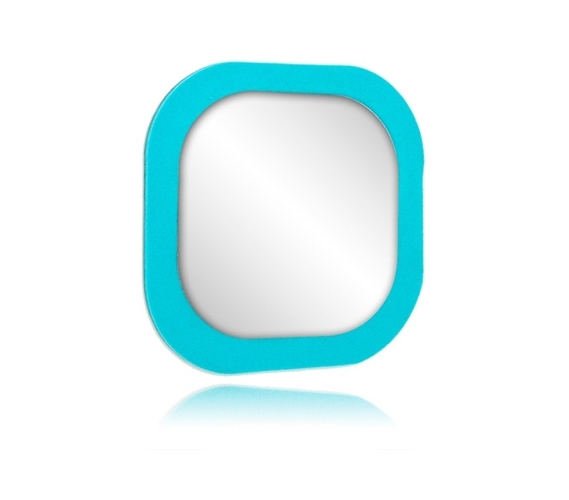 So when you need to quickly check how you look, put one of these handy Square Adhesive Mirrors right on your dorm wall. Having your own little dorm room mirror can be handy when applying makeup in the morning or when you're just brushing your hair. It can also get pretty time-consuming having to run back and forth to the communal bathroom just to apply some makeup and get ready in the morning. With the right dorm room supplies, though, you can get ready—save the showering part—right in your dorm room! It's pretty cool how such a simple dorm item like this stick-on mirror can save you so much time. After all, your dorm stuff should be cool and also make dorm life more convenient—which is exactly what this mirror for dorm rooms will do! Thanks to its pink coloring, you can also add a nice touch of dorm wall decor while having a handy mirror right in your dorm room.